A few weeks ago I was really down in the dumps about my child. His diagnosis is a complex one, and I found myself reverting back to old patterns of negative thinking and speaking. I was not giving my son a very positive vibration to mirror back to me or his teachers. When I was teaching I always used to tell my ES students to live in the positive. It is easy to say this to other people, but it is much harder when your child is the one with the diagnosis. This child, who has fantastic months followed by disastrous weeks that leave me feeling like an epic parental failure. I started wondering how I could bring the positive back into my parenting and into my relationship with my son. At the same time, I started listening to Dayna from Lemon Lime Adventures. The timing was miraculous! I totally forgot how much I liked this chica. I was listening to her workshop this week and she reminded me of something I had read about before, the 5:1 ratio. I decided to do a little parenting experiment based on this ratio, which was first identified by John Gottman in reference to couples. The beauty of this concept is that it works the same way when you apply it to your children. For every 1 negative interaction, you have to have 5 positive interactions for a relationship to be healthy and productive. In my version of the ratio, I find 5 ways to genuinely compliment my child every day. Yes it sounds cheesy, and waaaaay too simple. But can you imagine what would happen if you complimented your ADHD/Autistic child 5 times per day?! This is what happens when you compliment your child every day. As you begin to point out the good in every day, your child starts to notice. It’s like putting on positivity glasses – The whole family starts to notice nice things about each other. And even better, you all start to voice your observations. How often do we tell our children what we like about them? I mean sure, we pat them on the back when they get a perfect score on a spelling test. But we are rewarding them for performing, while reinforcing the idea that in order to gain approval we have to do everything perfectly. So many of our interactions are purely us trying to control our children or reward them for doing what WE want. Then we wonder why our children seem uninterested in actually talking to us. Why not compliment them on their efforts regardless of the outcome? The next time your child has a lower grade, compliment them on their work ethic. It shows them that the process is as important in life as the outcome. Children can sense when you are being genuine and when you are trying to manipulate them into doing what you want. This is the opposite of real connection. Concentrate on complimenting things like hard work, expressing their feelings appropriately, or making someone else smile. This is about complementing them on the person they are becoming. As I started to compliment, I noticed immediately that my son started telling me stories from his day. And the stories contained actual details from class or recess. The floodgates had opened. He was sharing with me instead of saying, “I don’t want to talk about it.” Sharing = connection. For about a month we have been struggling to explain to our son that bowing is part of martial arts. Every class begins with him taking off his shoes and running out onto the mat without bowing. Then at the end of class, he stands there totally still while everyone is bowing to each other and the instructor. My immediate response was to question how it could be humiliating if everyone was doing it. All of a sudden it hit me, my son doesn’t understand RESPECT. In his black and white Aspergers world, there is only winning/losing, best/worst, master/servant. He thinks that showing respect makes you “less than” – and this issue is creeping into every single one of his relationships. At home, at school, and at Jujitsu! I complimented him on actually expressing, to the best of his ability, why bowing was so hard. And we had the most amazing discussion. The problem hasn’t been solved, but I can actually understand what my son is struggling with for the first time and we can develop a plan to make it better. Think about it: Does negative correction help your child change their behavior? Or teach them problem-solving skills? Learning to problem solve and ask questions is a process for all kids, even moreso kids with ADHD or Autism. Tell your child what they did well first. Ask questions and get more information, then circle back to what you wish they had done differently. If your child is secure in the knowledge that they can navigate the world without fear of rejection from you, they will not be afraid to look for solutions independently. They understand that even if they do mess up, it is not the end of the world. Controlling your mindset is at least 80% of parenting, and it is much more powerful than any other strategy. For example, I have a tendency to ruminate about the future every time something is happening in the present. Because I have ADHD and anxiety. It is what it is. 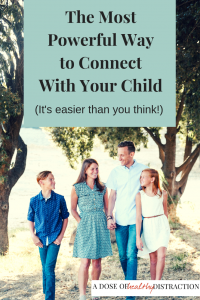 Connecting to my child is more important that punishing him. It’s easier to address a behavioral issue if your child knows that you always see the good in them. Start complimenting your children when they do things right. Catch them making good decisions and point it out. The most powerful way to connect with your child is to change your own mindset. As for me, I am going to follow my own advice – and live in the positive. Need more resources for living, laughing, and parenting with ADHD? Join my email list. I like to keep it inspirational, informational, and fun!